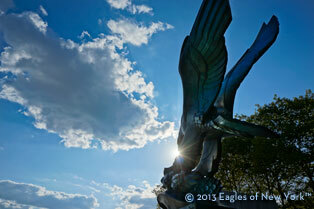 Eagles of New York™ is a photographic celebration of the eagle in the architecture and sculpture of New York City. Photographed at dozens of locations in the five boroughs, these marvelous images have been created by the New York photographer Richard Rivera. With their subtleties of light and shadow these large-format photographic transparencies showcase the rarely noticed eagle of the urban landscape. Eagles of New York™ provides fine art collectors a rare opportunity to invest early in Rivera’s aesthetics that offers great potential of economic benefit as Rivera advances his work. Rivera, the quintessential New Yorker, was born and raised on Manhattan’s east side, graduated from the School of Visual Arts in New York City, and has been a photographer, artist, and writer for over 30 years. His photographic work is in the permanent collection of the Brooklyn Museum. Photographed during and around the Occupy Wall Street protests of 2011, Eagles of New York™ speaks to the culture, resilience, and dynamics of an amazing City. Rivera’s distinctive art pieces selected from hundreds of photographs, are to be exhibited at major galleries, museums, sold to art collectors, and published in fine art books. Eagles of New York™ is the first of a planned series of large-scale art projects in major cities around the world—including Melbourne, begun in December 2012, and London to begin in late 2013. The proposed fine art book, Richard Rivera’s Eagles of New York™, has written content and over fifty photographs prepared for a publisher’s final selection. The manuscript includes historical references, photographic notes, and anecdotes of capturing these images in the heart of the bustling metropolis. For New Yorkers and the millions of tourists and visitors that fall in love with the City, this collection of photographs speaks directly to the endurance, mind, and heart of the people of New York City.